What does an IT boss, a frisbee coach and a ballroom dancer have in common? They are just three of the notable alumni who were awarded at the Nanyang Polytechnic (NYP) Alumni Contribution Awards Ceremony on 9 March 2018. These new awards recognise alumni who have actively contributed in various fields such as arts, culture and sports. While they might’ve since graduated from NYP and made their mark in society, these inspiring grads have not forgotten their roots and are always willing to give back. Read on as Alan Kuik, Benjamin Ho and Muhammad Azri share their NYP experiences. Meet Alan Kuik – the 39-year-old self-made boss of IT business firm, Infospace. 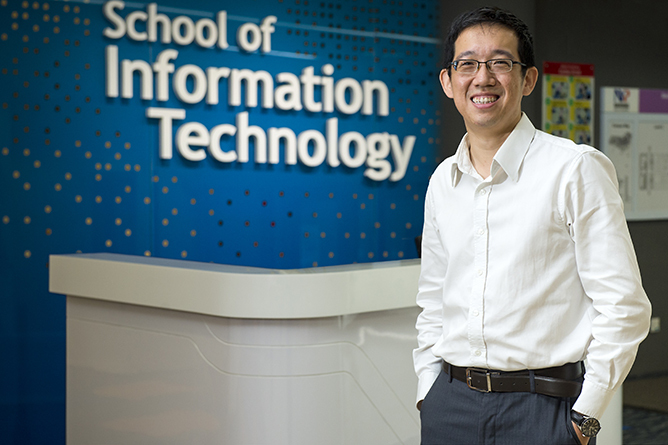 For the School of IT alumnus, Alan’s relationship with NYP didn’t just end at his graduation. Not only has Alan been involved with the campus events and happenings, the self-made entrepreneur has also taken on the responsibility to nurture his juniors’ skills by offering internship and part-time placements within his company. Through his mentorship and guidance, one of his former employees – Amos Tan, a graduate from the Diploma in Infocomm & Security – was even inspired to start his own company! “NYP is still is very much a part of my life,” Alan shares. “I want to help to train our next generation and make internship a meaningful learning experience.” His dedication in giving back to his alma mater has earned him an Alumni Contribution Award, becoming one of the 11 recipients recognised for their honourable efforts. 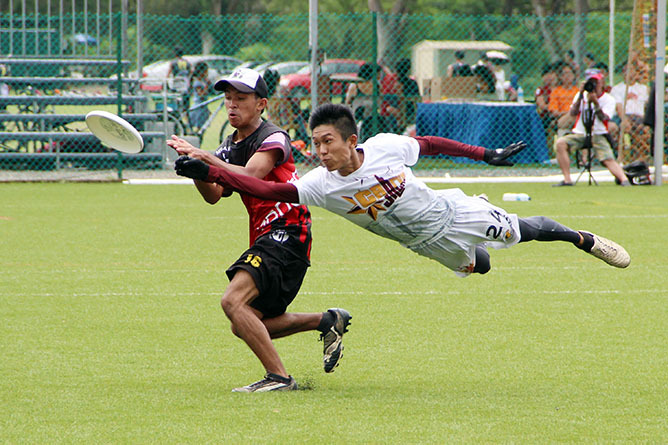 On Monday and Wednesday evenings, Benjamin Ho spends his time coaching at NYP’s Ultimate Frisbee club. The 32-year-old has been doing this for the past 14 years, regardless of rain or shine. But that’s not the only reason that scored him the Alumni Contribution Award – it’s also his sense of purpose, duty and responsibility that makes him a winner in our books. He first founded the club as a second-year Diploma in Business Management student in 2004, and has since built a tight-knit community of passionate players who excel both on and off the field. His personal coaching motto? “Better player, better person”. He adds, “I was taught to serve, and would like my players to remember to serve others as well.” The club has been on a winning streak, having been crowned as the eight-time reigning champion for the Polytechnic-ITE Games and the seven-time champion for the Inter-Varsity-Polytechnic Games. “NYP was where my passion for dance started,” says Muhammad Azri, and he’s never looked back. Despite graduating from NYP about eight years ago, one can still expect to see him on campus at least twice a week. The dedicated alumnus comes back to NYP as a volunteer coach to mentor his juniors in the La Ballroom En Masse CCA, which specialises in latin ballroom dancing. What does a 21-year-old and a 42-year-old have in common? For MDIS students Angelyn Rachel Fletcher and Ailene Tan, it turns out that they have plenty of similarities with one another despite being two decades apart. With a mutual love for psychology, 21-year-old Angelyn and 42-year-old Ailene both decided to enrol in the International Foundation Diploma in Psychology at MDIS. It doesn’t matter whether you’re a freshman hoping to jumpstart your career, or an adult learner interested in fine-tuning your craft – these two aspiring psychology professionals prove that age is no barrier when it comes to pursuing your passion. Not only do they get along well with each other, the unlikely classmates also share similar views on issues they care about. We speak to Angelyn and Ailene to learn more about their unique perspectives and eye-opening learning experience at MDIS. What made you decide to pursue a Diploma in Psychology? Angelyn: I was curious about what made a person tick and what made them do what they did. I was very into the world of criminology and my police officer dad couldn’t have been more overjoyed. But upon hopping onto the psychology train, I realised that it wasn’t as easy as I had thought and there are so many more sides to it – gerontology, clinical, educational, etc. From there, I decided to pave a path for myself and pursue a diploma in the field. Ailene: Similarly, I was curious about people; I wanted to know how a person behaves and what their thoughts are through interaction and communication. Psychology has always been my passion since I was 25, but I wasn’t brave enough to step out of my comfort zone due to financial concerns in the past. Having been in the supply chain business for 20 years, it became too much of a routine and I felt like there wasn’t anymore room for personal growth. I’ve been harbouring this thought for more than a decade and there was an inner voice that kept saying “never try, never know”, so why not? Now, I realised that nothing is impossible as long as you put in effort. What first sparked your passion for psychology? Angelyn: I’ve always had the knack for helping others, so I thought that teaching would be a strong start to my education journey. However, after working in a childcare centre for six months, I realised that there was so much more to learn about the children there instead of just teaching them. There was a particular kid who caught my attention – he had ADHD so the students were separated from him as parents would complain if he disturbed the children. I couldn’t disagree that his behaviour would’ve caused discomfort to the others, but I felt that it was unfair. Hence, I researched on courses related to the situation after I left the job, and stumbled upon the MDIS School of Psychology. Neglect can have severe consequences on anyone, regardless of gender, race or religion. I hope to make positive changes in their lives, no matter how small. What was your initial expectation of the psychology field and how did it differ from what you thought it would be? Angelyn: It’s more than just about helping those in need mentally to achieve a state of normality, but it also requires so much from me as a well-rounded individual – to be patient, understanding, a good listener, and always having empathy no matter what. Ever since I stepped into MDIS, the lecturers have always made me view psychology as so much more than reading people’s behaviour and helping them, so much so that I’ve never been happier pursuing this field of interest. Having received the Academic Excellence Award (Top 3 student) as well being part of countless events in school, it’s so rewarding to see how far I’ve come. What’s a typical day for you like in school? Angelyn: For me, I would try to make time for those who are always by themselves before tending to my own tasks at hand. In psychology terms, I have a type-B personality (extrovert) so I’m the kind to put others before myself regardless of the situation. Sometimes I find myself juggling much more than I can handle, but I’ve started to adjust myself to become more attentive in my studies while finding a balance for others. In class, we enjoy putting ourselves in role play scenarios, where we would research about the facts and sometimes get so engrossed in the topic that time would just fly by. We often help one another out, be it assignments or projects. Without a doubt, there’ve been countless arguments among the groups over the past few months, but I’m glad that everyone can be themselves because it’s the most important to be yourself and not the way others would want you to. How are the classroom dynamics like between the both of you? Angelyn: I’ve always seen Aileen as a big sister to me. She’ll be there whenever I need help and the one who keeps me on track and motivated when the deadlines are coming up. In fact, I feel that having people from all different walks of life just makes the classroom that much more lively and unique in every way. Ailene: Although we have a two-decade age gap, it’s fun to be with these youngsters. They are an IT-savvy and creative bunch, and I learned heaps of things from them that I didn’t get a chance to be exposed to when I was their age. 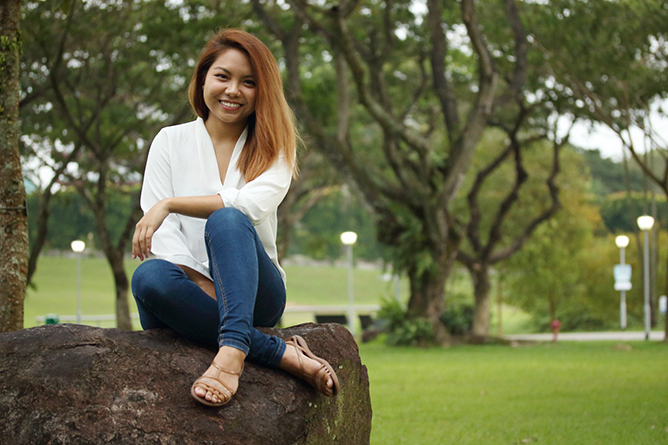 For Ailene, what are some of the differences between being a student back then and now as an MDIS student? Ailene: In the past, learning took place in the classroom and facts were derived from the textbooks we had. Now, we learn and explore new ideas from each other, as well as through books, movies and the Internet thanks to the advancement of technology. At what point of your life would you/did you consider yourself as an adult? Angelyn: I wouldn’t consider myself an adult based on a certain age. Instead, I’ll consider myself an adult when I’m able to be independent in making my own decisions. Being an adult would mean being financially stable and able to balance every other aspect of your life simultaneously. 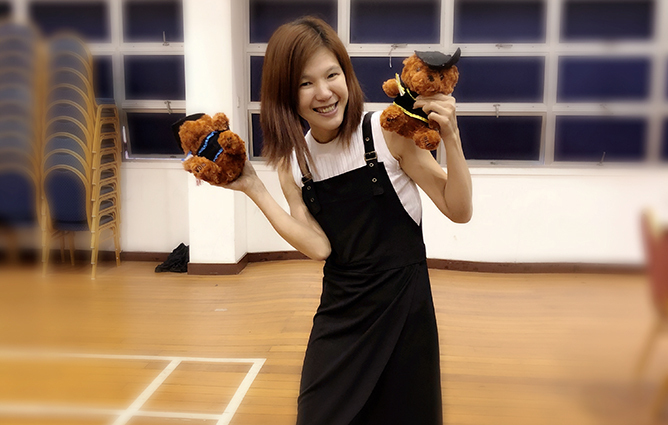 Ailene: For me, it was when I first started working straight after the ‘O’ Levels. Once you’ve entered the workforce, you can only count on yourself to tackle any obstacles that come your way. From there, you’ll become more mature as you go through the challenges. What keeps the both of you motivated when the going gets tough? Angelyn: My family has always been my motivation. That, and also – grit. It’s a word that I stand by to motivate me again and again, after watching a video of Angela Lee Duckworth talking about it. Just like any other teenager, I found myself always asking the same question whenever I’m faced with pressure during the course: “Do I really want this?” However, ever since that video, I’d remind myself of the lives I could help in the future and the places it will take me after I graduate. Ailene: I come from a humble family so my parents couldn’t afford my school fees. Hence, I had to juggle between two jobs while pursuing my studies. It was a challenging journey, but through perseverance and determination, I trust that you will meet your goals and objectives. There is no easy route in life so never give up. From a psychology perspective, what’s the important takeaway you’ve learned about yourself after embarking on this journey? Angelyn: I can build more meaningful relationships now that I’m able to better understand people and their behaviour. Thanks to psychology, it has helped in my communications skills to be more effective. I’m also able to understand myself better, which resulted in me having more self-confidence as I’m able to identify my weaknesses and improve on them. Ailene: I began to have a different mindset and better understanding towards others. Instead of seeing the worst aspect of things, I became more optimistic. What are your personal expectations for the future? Angelyn: I hope to be able to use my skills in the psychology field and open my own practice someday instead of being pinned down in a 9 to 5 job. I want to have the continuous passion and grit to improve myself along the way no matter what age I may be – be it 21 or 101. Ailene: Aside from pursuing a Degree in Psychology, I also hope to contribute to the society by doing more volunteer work. Ailene: Pursue your dreams and never give up. Bad times won’t last, take it as a journey and you will grow to be a better person. At the end of the day, you will definitely be proud of yourself. Don’t let anything hold you back from realising your dreams! If you’re interested in pursuing the field of psychology like Angelyn and Ailene, click here to find out more about the psychology programmes available at MDIS. Stressed out about the ever-piling workload? Panicking over the looming deadlines? For days when you’re not feeling 100 per cent and need a little TLC, these simple self-care tips will have you perking back up in no time. You deserve it! When we think of bad addictive habits, we think of drinking, smoking, gambling, and doing drugs. But unhealthy addictions can be more subtle – it could be sticking with a bad partner because you’re scared of feeling unwanted, or burning yourself out to get straight As because you need everything to be perfect all the time. Are these things helping or harming you? Do they really make you happy? It’s time for a review. All through our lives, we’re taught that in order to be on top, we need to beat out others – whether it’s to have better grades or flashier clothes than your peers. The world (thankfully) doesn’t operate like that. While some people will work themselves to death trying to outdo others, you should know that them having more does not mean you have less. Instead, you can be happy for other people’s successes while celebrating your own too. Friends ultimately want the best for each other but sometimes don’t react well to change. When you’re trying to improve yourself or ditch bad habits, your pals may assume you’ll become a different person and dump them sooner or later. For example, if your clique’s hangout spot is at a fast food joint but you’ve decided to eat more healthily, they might make fun of your new diet, influencing you to think of giving up. Reassure your friends that there’s nothing to worry about, and you can even invite them to pick up better habits. Alternatively, if you have truly moved on from the group, know that there’s nothing wrong with that too. Studies have shown that we tend to get hung up on setbacks, and it’s perfectly understandable. Sadness and anger are very intense emotions that are hard to let go of, but it’s important to understand that these feelings are also not useful. Instead, reframe unfavourable experiences in a positive and constructive way by reflecting on everything you’ve learned or achieved because of the incident. The saying “what doesn’t kill you makes you stronger” is popular for a reason. Learn to love yourself. How would you feel if you knew your best friends called themselves “stupid”, “ugly”, or “fat”? How would you feel if others called them that? It would be unacceptable, yet so many of us heap these ugly labels on ourselves without a second thought. There’s also that puzzling culture of one-upping each other on self- deprecating insults, which can affect your confidence if you end up believing these fallacies. The next time someone dismisses themselves, tell them to stop and don’t be tempted to contribute to a meaningless conversation. Similarly, think of your own feelings before you say something hurtful about yourself. Being nice to others doesn’t mean discounting your own feelings. It’s okay to take up space in the world! If you feel that something is not right or that you aren’t being treated fairly, speak up. Doing so might make you feel uncomfortable at first, but you can start with small things like correcting the way people have been mispronouncing your name, or asking a friend to return money they owe. Be tactful, but also firm, straightforward, and unapologetic. You don’t always have to save nice things for special occasions. Once in a while, it’s good to treat yourself to new clothes, a pedicure or massage for no reason other than to make yourself happy. Doesn’t everyone like a random sweet gesture? You can be generous to yourself anytime. To celebrate the month of love, we asked 5 millennials to write an open letter to the person they loved the most. Some feelings are hard to express, let your written words do the talking. It’s pretty undeniable that you’ve made a tremendous impact on my life. Like an ‘asteroid hitting earth’ kind of impact. I know that seems like a bad thing but I assure you it isn’t. We really should have asteroid showers more often; drastic change is good. Sometimes I wish I had met you sooner. It’s kind of a shame that we spent only one year in school together. Imagine the amount of damage that could have been done if we had four years. I hope you know that when I say ‘damage’, I mean it in the most affectionate manner possible. Kudos to us though, for making the most out of only a year. This is the part where you roll your eyes, if you have not already begun. Anyway, as you can tell, this is obviously a heartfelt letter and those nostalgic tears should be filling your eyes to the brim. right. About. Now. Or at the very least I hope I’m still as entertaining as ever. Jokes aside, I really mean it when I say that you’re one of the few people who helped drive my life in the right direction, and I’ve reserved a section of my heart just for you. Thank you for walking into my life nearly seven years ago, and for staying put. I need you to know that I appreciate every single time you’ve purposefully corrected my grammar and spelling, and for kicking me (and other people) out of class multiple times because bailing on english homework was trending. When I was young, I kept hearing the saying “A parents’ love is unconditional” but I never understood the meaning behind it. Growing up with three other siblings, I used to think that it’s your duty to provide me with what I need, in terms of education and basic necessities. It’s mummy’s duty to wake me up and make me breakfast, papa’s duty to ensure my family is well-fed and buy me the newest gadgets. It wasn’t until I went abroad for my studies in Australia that I realised how much I’ve taken my parents for granted. There, I had no one to turn to and rely on. Nobody was around to wake me up in the morning, prepare dinner for me after a long day, or to change my bedsheets when I’m tired. One of my earliest memories of you, is standing by your bed, anxiously sucking on my pacifier as you packed your stuff and patiently explained to me that you would be away for some time, far away where I cannot follow, and that I should be a good girl and eat my meals properly. I remember feeling confused and wondering why I wouldn’t be allowed to follow when I could tag along even when you went to the wet market where there were always a lot of people and I so easily got swallowed up by the crowd. You left me and it was possibly the saddest period of my short life then, and I remember crying at the airport when you left with a big group of people all wearing white. That was the only time we have been apart for such a long period of time. I slept in your bed till I was in my teens when mum decided we could turn the study room into a bedroom for me. Life has been difficult on you, but you always ensured we had good food to eat at home every day, even when your legs hurt too much when you stand for long periods in the kitchen. I love how much perseverance you have, a particular brand that belong to people of your generation, totally absent in mine. You always swallow your anger and sadness and kept them in your heart even when you were being unfairly treated, all because you want to avoid conflict, as much as it frustrates me that you don’t want to stand up for yourself. And that is my biggest failure as a granddaughter – that I allow you to be treated as such when you deserve to have someone stand up for you and speak on your behalf. She is a woman, a mother, a daughter, a wife, and a grandmother. She is strong, smart and crafty. She worked her way up and made many wise decisions for the family. She started from cents to notes of money that could be found tucked away in the pockets of her blouses. She believed that destiny lies in your own hands and that it was important not to depend on someone else. She chose true love over having rich kids. She knew that money and beauty doesn’t last forever. She fell sick. She lied on the hospital bed and was put under morphine. She was motionless, save for the tears pooling in her eyes. She persevered and wanted to stay on longer. She wanted to attend the graduation ceremonies and wedding dinners of her grandchildren. She wanted to fall asleep beside her partner every night. She just wanted to have a little more time. I’d like to thank you so much for raising me well and giving me so many things that i can learn up till now… I feel so lucky because I’m your daughter. I know that I make you sad and upset at times, I didn’t mean to hurt your feelings, but I just wanted you to understand that I’m not a kid anymore (sorry for my selfish self). I do actually know how I should behave, and I understand that everything you tell me is for my own good and to help me be able to have the best future I could hope for. My prayers are for mum, dad and my sister; everyday I pray for all of you to be healthy and happy in every moment, live a long and enjoyable life and for only the best things to be graced upon you guys. Disability is no hurdle for para-athlete Adelia Naomi Yokoyama, as she overcame all odds to emerge victorious at the 2017 Deaflympics. To say that Adelia Naomi Yokoyama is an inspiration would be an understatement. Despite being born deaf, she never lets her hearing impairment deter her from achieving her dreams. 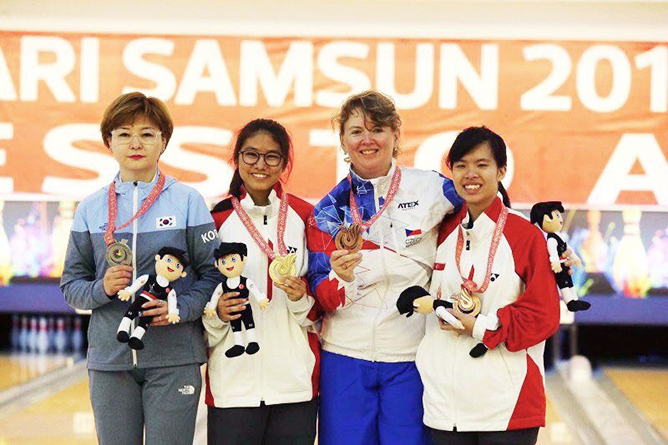 Her hard work paid off – at the recent Deaflympics, the 18-year-old trailblazer made history by bagging Singapore’s first ever gold medal in the bowling women’s masters event. Fresh off her record-breaking win, we caught up with the young bowling champ to learn how she overcomes adversity, what drives her and more. Congratulations on clinching the gold medal at the Deaflympics! How does it feel to set a new record for Singapore? I am truly overjoyed! It’s hard to describe the feeling in words as I never expected to return with a gold medal, much less set a new record. Winning gold for Singapore has always been my dream from the moment I was selected to represent our country for the Deaflympics. I don’t have much experience competing internationally, but I trained intensively to build my stamina and mental toughness with the support of the Deaf Sports Association. When did you first discover your passion for bowling? I first discovered it around the age of eight when I joined my sister and her friends for a game of bowling. It was then that I decided to take it up as a CCA in school and chose to pursue the sport further as I was selected to be on the school team and started participating in competitions. With sisters Natasha and Yukie being athletes in their own right, do you feel ever feel pressured to live up to expectations? I do feel pressured to perform well, especially since both of them have represented Singapore in prestigious events and have a good track record in their respective disciplines. 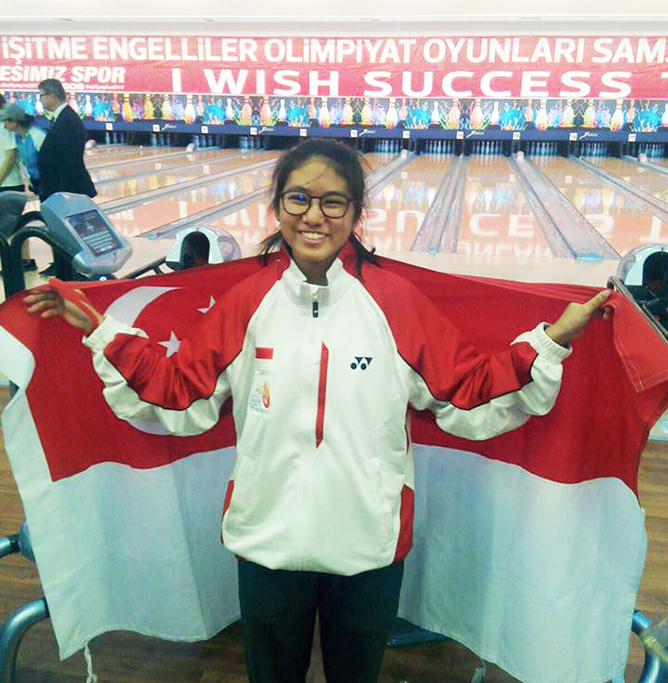 Natasha finished 5th at the 2010 Youth Olympic Games, while Yukie has won multiple medals and is a world champion! For me, I never won any major competitions prior to the Deaflympics thus I do feel pressured to an extent, but it’s a healthy amount which serves as a driving force for me. As a current student at PSB Academy, how do you balance your time between school and training? It was manageable as I only had a few hours of school to attend each day, coupled with training three times a week. The real challenge came when the Deaflympics drew closer, marking a spike in my training sessions. At the same time, I also enrolled for three new modules before I flew off to Turkey for the competition. Catching up was tough as I missed three weeks of school, but thankfully, the journey was made less exhausting through PSB Academy’s generosity in accommodating to my schedule. Since embarking on this journey, what has been the most memorable moment thus far? The opportunity of participating in the Deaflympics! Beyond the competition and the win, the bonds that I’ve forged with my team is a reward in itself. We even became more well-versed in sign language while training together. In particular, this experience has helped me realise the importance of working closely with a coach, as Coach Francis made a huge impact on my progress as an athlete by encouraging and believing in me. When a coach and an athlete have great faith in each other, their ability to communicate with one another becomes unrivalled. Thus, I am so thankful for Coach Francis. We can’t begin to imagine the challenges you deal with everyday with your hearing impairment, especially as a sportswoman. What keeps you motivated? The journey definitely had its bumps, but I’ve learnt to cope with stress thanks to my loved ones. My family has given me the best support in everything, and they truly inspire me to become a better person and succeed in life. Growing up, I was also given speech therapy and specialised help for my hearing impairment, such that I’m able to communicate well with the people I meet. Today, I have no difficulties interacting with others and in fact, I would say that I’m a social butterfly! What’s a misconception people have about para-athletes that you would like to set straight? They tend to think that we are different from ‘normal people’ or that we are unable to live life to the fullest. This cannot be further from the truth as every individual is different, special and unique. If a hearing impaired person like me can succeed, so can everyone else. I want to encourage and motivate people to chase their dreams instead of erring on the side of caution. Nothing is impossible! Moving forward, what are your goals for 2018? Since I haven’t had much experience participating in international bowling competitions, I plan to take part in as many as possible to gain more exposure. I hope to earn a new personal best score for the upcoming competitions, particularly for the ASEAN Deaf Games which will be held in December. I also aim to get into the National Youth Squad in 2018. This article was adapted from Vol.30 Issue 1 issue of Teenage. Meet The 23-Year-Old Fashion Designer Who Debuted Her Graduate Showcase At Singapore Fashion Week!